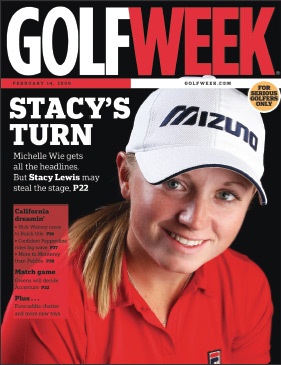 Ask any golf writer in the country about the best story in women's golf, and chances are they will say: Stacy Lewis. It isn't because she has won a major on the LPGA Tour and in the process, took down the #1 player in the world in the final round. It isn't because she won 4 tournaments in 2012 and became the first American player to win LPGA Player of the Year since 1994, or because she is closing in on the #1 ranking in the world. It isn't just because she has been the best amateur player in the country over the 2 years before turning pro, or because she was the 2007 NCAA champion, or even because she has won 12 tournaments at the collegiate level while putting the University of Arkansas' women's golf program on the map. Stacy Lewis is the best story in women's golf because of the things that she's had to overcome in order to just play golf again. 6 1/2 years in a back brace and back surgery, after which she wasn't sure she would even be able to walk, let alone swing a golf club again. The following are the actual x-rays of Stacy's spine taken after she had worn her back brace for almost 7 years. The "Pre-Operation X-ray" shows that the curvature was not healed. The "Post-Operation X-ray" shows the stainless steel rod and 5 screws that were implanted in her back. Amazingly, Stacy says that this doesn't set off metal detectors in airports!